Work Great. Essential for Organization. Pros: Easy access, great for organization. Review: These are great for organization with the Ultimate Kneeboard (Loose Ring Version). I give this item 4 stars only because it is advertised as "7 Hole" version, however these dont have any holes, and are designed to "slip" in between the rings. If you have a single hole punch, just punch 2 holes (1 in the top and 1 in the bottom) using the sheet protectors as a template. They will fit great and maintain their functionality too!. Review: Does just what it's supposed to do. Review: Work well. My only complaint was that they didn't fit quite right in the 2in. Bonded Leather Jeppesen Binder that I ordered. But nothing that a razor and about ten minutes couldn't fix! Review: I used them a few times. They don't have holes, so you have to be careful, because else the could fall out while you are turning a page. Its a good way to find the correct page. Review: Essential for any pilot flying IFR. 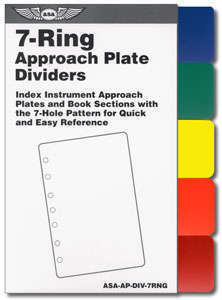 Q: are these dividers for 5 1/2 by 8 1/2 7 ring binders? A: That will work, the dimensions of the dividers are 8.5" by 6".